“This is Playa Jardín which was designed by the world famous Lanzarote-born architect, César Manrique,” I proudly point out to Miles as we stroll along the seafront of Puerto de la Cruz beside its volcanic beach landscaped with palm trees and a vast cactus garden. I’m speechless. Not only has it never occurred to me that the beautiful, black/silver sand is like dirt, but I’m taken aback that such a notion should pop into anyone’s head. There is no doubt that first time visitors to a volcanic island experience a beach culture shock as they gaze upon the dark sand shores that are so alien to their stereotypical view of a tropical island. The deep, hypnotic, azure waters and wafting palm trees are present and correct but the talcum, soft shores of a Robinson Crusoe fantasy are missing, and in their place are taupe grey swathes bordering the shoreline, their obsidian particles glinting in the sun like stowaway fairy lights. 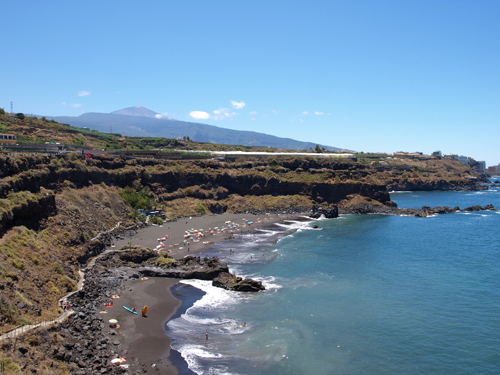 Of course, not all beaches on Tenerife have black sand. The majority of the island’s most popular resorts of the south coast have beautiful, man-made, golden beaches like the endless Las Vistas in Los Cristianos and the perfectly manicured Playa Del Duque in Costa Adeje. 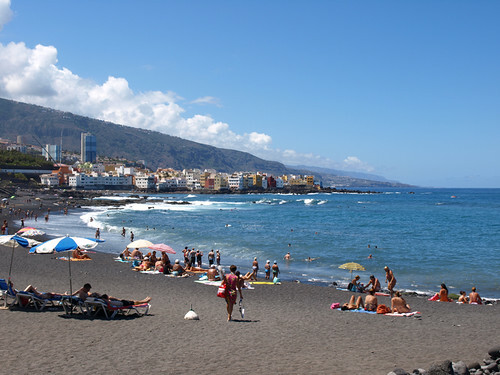 For the thousands of visitors who daily scour the internet for flights to Tenerife in order to replace the depressing grip of a Northern European winter with the warmth of the sun on their faces and the feel of sand between their toes, if they stick to the islands’ southern resorts, they may never experience the beach culture shock. 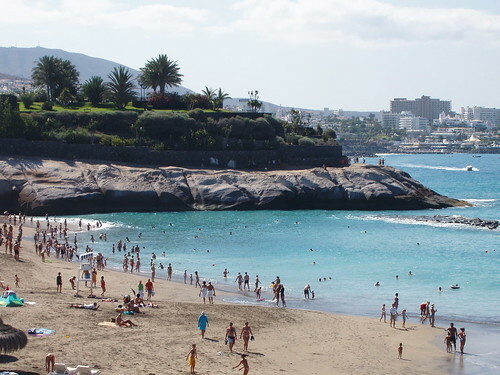 Beaches in the Canary Islands are an east west divide. The further east you go the more concentrated the presence of pale pumice rocks which, coupled with the Islands’ proximity to West Africa which allows sand from the Sahara to be carried in the wind and deposited on the shores, creates natural pale sand. For that reason the eastern islands of Fuerteventura, Gran Canaria and Lanzarote have natural golden shores. By contrast, travel west to the islands of El Hierro, La Palma and La Gomera and you’ll find beaches formed from the darker basalt rocks. Here on Tenerife, which lies in the centre of the archipelago, you’ll find natural golden beaches in the eastern resorts like El Médano where the near constant wind doesn’t just provide the perfect conditions for the wind surfers and kite boarders but also ensures an endless supply of Saharan grains. But head instead to the north and west of the island and you’ll find the sultry, dark sand shores of picturesque coves like Playa de la Arena, Los Gigantes and Puerto de la Cruz.